The Jewelry and Metals Survey (JAMS) is SNAG’s annual survey of jewelry and metals in contemporary art, architecture, craft, and design created in the previous year by emerging and established artists, as well as students, selected by a jury of experts including curators, artists, designers, gallery owners, and historians. 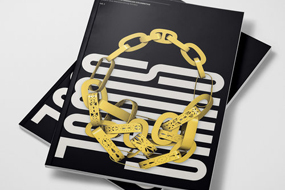 In showcasing approximately 200-juried objects, each publication highlights the wide range of current ideas and making practices in the field of jewelry and metals. 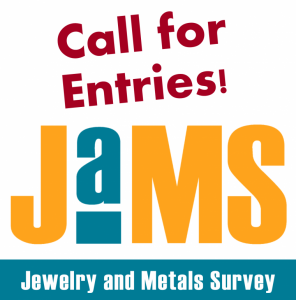 SNAG invites artists, craftspeople, designers, public artists, and architects worldwide to submit images of new works focusing on metal and/or jewelry for the 2019 JAMS. Everyone from any sector of the field at any level of experience is encouraged to apply. Curators are also welcome to submit recent work purchased by their institution. Deadline: June 17th, 2019 11:59 pm MST. The jury will work to select the top 100 images from the submissions; each juror will also select an additional 33 images to be published. The 2019 JAMS will be published in late 2019/early 2020. Warren Holzman is a Philadelphia based artist working in forged and fabricated metals and the owner of Holzman Iron Studio LTD, notable for executing craftwork in metals for residential and commercial clients nationally and internationally. He has received numerous public art commissions and his work is included in private collections across the country, most notably the new architectural metalwork at the Bryn Athyn Cathedral and Glencairn Museum. In 2015, Holzman co-founded the Building Arts Program at Bryn Athyn College in Pennsylvania and is a blacksmithing instructor there. He has also taught at Peters Valley School of Crafts, Penland School of Crafts, New England School of Metalwork, University of the Arts, and Moore College of Art and Design. He has been the visiting artist and lecturer at Kent State University, SUNY New Paltz, SNAG New Orleans 2018 and The California Blacksmithing Association. Bryna Pomp began her career studying art history and French at Wheaton College, and was quite interested in the business of fashion and retailing. She went through the executive training program at Federated Department Stores, the best program in America, and the first week of the program she became the assistant buyer in fashion jewelry. After learning the skills of running a jewelry business from the retailer’s point of view, Pomp then worked for a number of very large fashion jewelry companies, focusing on product development, strategic business planning, brand positioning, merchandising and marketing. She has always worked very closely with the companies’ designers and because of this she has a solid understanding of the creative process and how jewelry is actually made. During all these years Pomp was always extremely interested in the less mainstream sectors of studio and art jewelry, which are now her primary focus. In 2011, Pomp became the curator of LOOT, the annual exhibition and sale of studio and art jewelry at the Museum of Arts and Design. LOOT has existed since the 1990’s. Pomp has successfully curated six editions of LOOT and is now working on LOOT 2017, which will take place at the Museum 3-8 April 2017. Lena Vigna is currently the Curator of Exhibitions at the Racine Art Museum in Racine, Wisconsin, where she curates and oversees the production and implementation of 10-15 exhibitions per year and heads the department. Lena Vigna has a particular interest in the contemporary fields of adornment, sculpture, fiber, and installation. Vigna has curated numerous solo and group exhibitions and written several essays that explore issues relevant to contemporary art and society. Areas of investigation include political garments and accessories; jewelry that reconsiders the past in the present; luxury, consumption, and excess; the intersection of science fiction and craft; extreme wearable and non-wearable garments; lace; and the relationship between jewelry and painting (the subject of a 2012 article in Metalsmith). Vigna was awarded a Craft Research Fund Project Grant from the Center for Craft, Creativity, and Design for an exhibition about contemporary approaches to lace (Laced with History) and received an Art Jewelry Forum for Adornment and Excess: Jewelry in the 21st Century. Named one of the top craft curators under 50 in a non-published museum survey, she is also a big fan of vintage clothes and custom cars. This annual publication highlights the best new work being made in the international field of jewelry and metals. The 2017 JAMS book can be ordered here. The 2018 JAMS will be available soon!